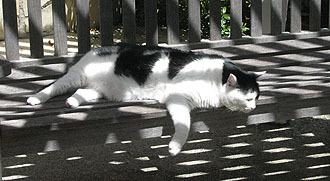 Back in 2004, Inkblot got his shot at fame when the New York Times decided to write a story about him. Seriously. Here it is. I still use that picture on my Facebook page. But time marches on, and Twitter has replaced blogs as the hot new social media. 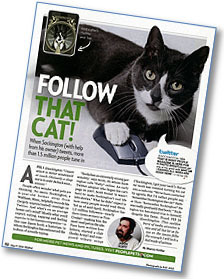 And the star of Twitter isn’t Inkblot, it’s Sockington, profiled this week in People magazine. Inkblot gets a few thousand followers via this blog, but Socks gets 1.5 million followers via Twitter. As you can see below, that makes Inkblot melancholy. Over on the left, he’s practically given up at the thought of matching Socks’ fan base. It’s just too daunting a task what with sunny weather beckoning in the backyard. To make it worse, his amanuensis, unlike Jason Scott, is an aggressively non-clever human who has no chance of creating an Inkblot Twitter feed that would draw even 1.5 thousand followers, let alone millions. Very sad. Domino, on the other hand, thinks Inkblot already gets too much attention and is showing off her bathing abilities this week for your approval. 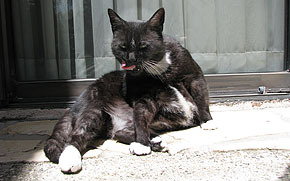 I swear, Domino is the loudest, lickiest cat in the world. She keeps Marian up for at least ten minutes every night by hopping onto her pillow at bedtime and proceeding to give herself an extremely slurpy, extremely thorough bath. It’s an experience not to be missed.